The Hurricane was developed as a monoplane derivative of Hawker's biplane the Fury. It was equipped with a lot of novelties like retractable landing gears and the powerful and newly developed Rolls Royce Merlin engine. In late 1934 the British Air Ministry placed an order for Hawker's Interceptor Monoplane and the first prototype flew on the 6 November 1935. It entered service in December 1937 and rapidly became the mainstay fighter in the RAF. It carried the main defence against the Germans in the Battle Of Britain alongside the Spitfires (who was much less numerous). It continued to be used through out the WWII in numerous roles as bomber-interceptors, fighter-bombers and ground support aircraft in addition to fighters. 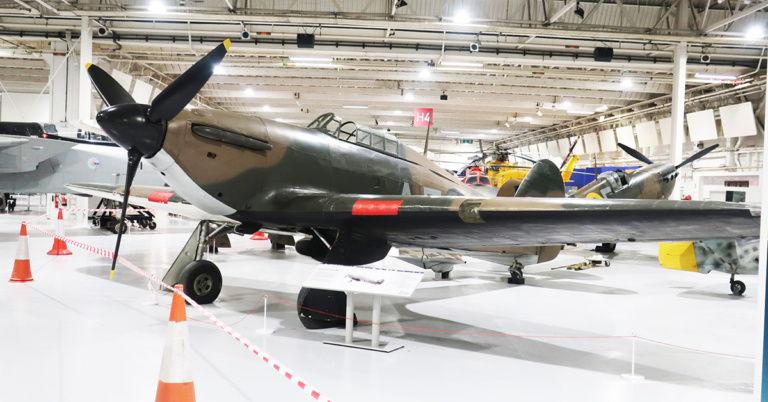 A Sea Hurricane was developed for the Royal Navy that was converted to be used from catapults aboard ships, protecting the North Sea convoys. The Hawker Hurricane Mk. IIB here is at static display at Imperial War Museum (IWM) in Duxford. The second gallery is pictures of three still air worthy Hurricanes that partook in Flying Legends at Duxford in July 2018. Building the Hawker Hurricane in 1/48? There is several kits of the Hurricane in this scale (1/48). The most recent tooling is Airfix new Hurricane Mk.I from 2016 which has later been released in a tropical version and again as a Sea Hurricane Mk.IB. But as mentioned there are many more.